The Cycle Show at Earls Court in London opens on Thursday for a press day, meaning the nation’s newspapers and colour supplements will be dusting off their cliches based around the theme of ‘saddling up’ and getting ‘on your bike’ for the weekend’s editions. Teasing aside, with tube strikes and Boris Bikes pushing cycling a bit further forward in the national transport agenda, it’s expected that the Cycle Show will be a proper bun fight with journalists from a record number of publications already booked to attend. Dare we say it, but it might even mean cycling is cool. 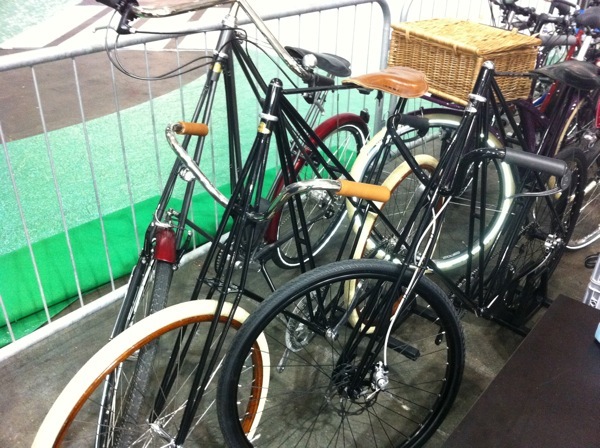 Of course, nothing is cooler in London than single-speed road bikes and we could devote this and the next few days’ reports to nothing but this category if the exhibitors’ stands being built this afternoon are anything to go by. A good example is this lovely steel Bianchi Pista Via Brera (above) for £790; although not strictly speaking a new model – it was launched for the 2010 model year – with its understated looks it did manage to slip under the radar last year. Particularly thoughtful is the SRAM Torpedo rear hub which, with an allen key, can be quickly converted from fixed to freewheel without needing to flip the wheel. Around the block from Bianchi is the very antithesis of a huge brand, but Italian nevertheless. 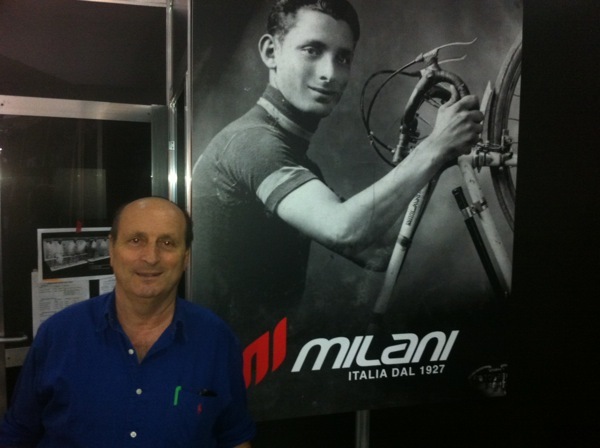 Making its fourth visit to exhibit at the Cycle Show, Milani is a small family firm whose Celeste Milani (above) readily concedes that they’ve not been around quite as long as Bianchi – his father started the company in 1927 whereas the big neighbour opened in 1885. It’s a bit early to be proffering ‘Best Road Bike in Show’ awards but this Milani Acciaio Puro (below) certainly stopped us in our tracks. With a beautiful welded Columbus XCR stainless steel frame with Campagnolo Super Record and 3T components, we may also also have been swayed by the ‘pearl or two of wisdom’ from the front of Milani’s catalogue: ‘The arrow is shot from the bow but it’s the warrior that decides the target.’ Sounds even better in Italian. Condor Cycles is reviving an old name from the 1950s. 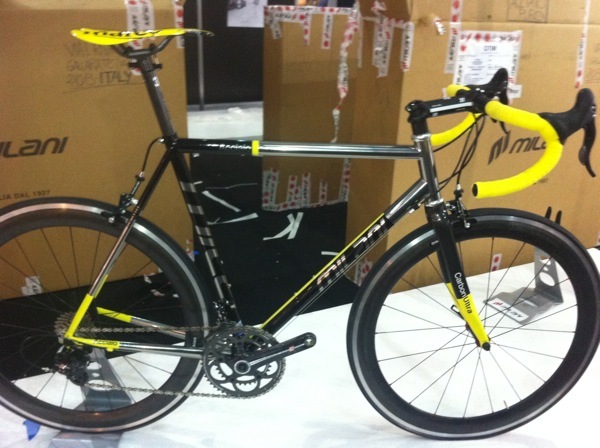 Paris Cycles was a brand name Condor acquired years ago but never really knew what to do with it while the road bike market was either moribund or hell-bent on exploring new and alternative materials to steel. Now that lovingly fondling hand-cut lugs is all the rage again, Condor think they’ve timed it just right to resurrect the Paris name. Except, as Grant Young from Condor says, “the lugs and tubes are now laser cut.” Indeed, this opens up some possibilities that the builders of the first post-war, bi-laminated frames would have been pushed to achieve. But it doesn’t change the need to hand-braze the frame’s joints with impressive skill and you could spend an hour admiring the workmanship. 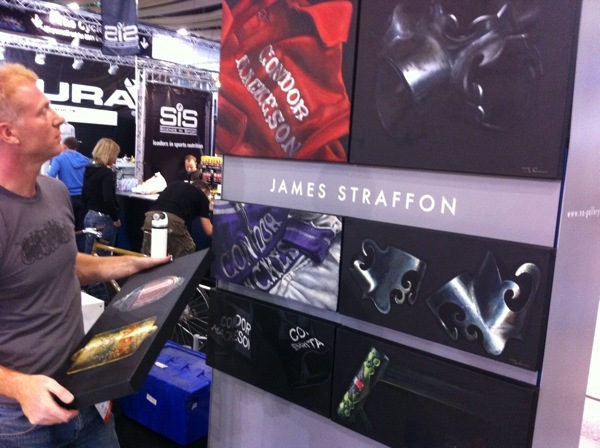 Right at the centre of the Condor stand is an exhibition devoted to the paintings of James Straffon. 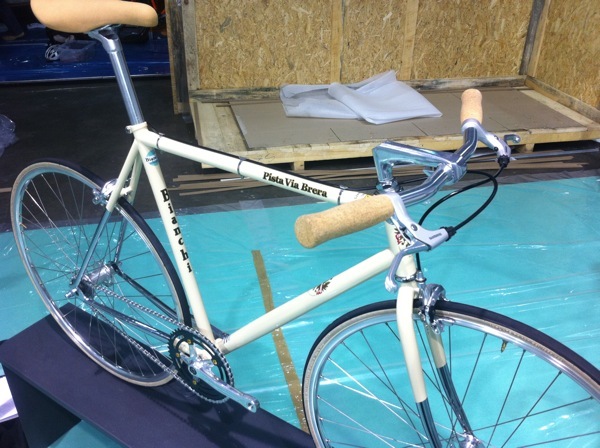 We last mentioned Straffon (below) back in the summer when he showed his cycling-themed art at the Paul Smith shop in London’s Terminal 5. 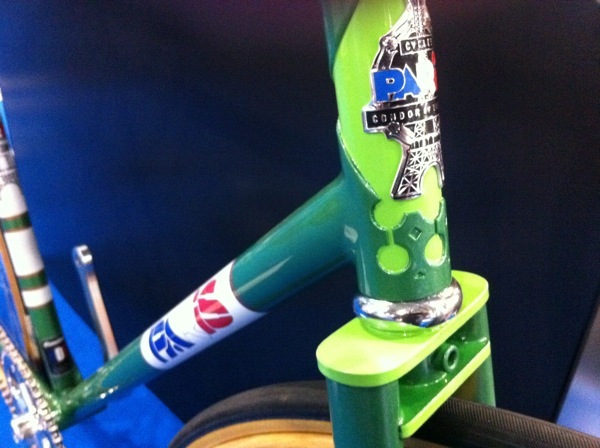 This time the inspiration is artefacts dug out of Condor Cycles’ collection of memorabilia accumulated over many years. There are paintings of jerseys from the Mackeson racing era and frame lugs back from when they really were cut by hand. The idea sprang from Condor blogging about a bag of old head badges they’d found and Straffon was so excited he immediately got in touch to paint them. It’s not all racing bikes at the Cycle Show. The National Cycling Museum has a display of historical bicycles and to bring history right up to date the German company Kemper (above) has these modern versions of the Pedersen design. We’re looking forward to seeing them in their display and maybe even get a test ride. Even cars get an honorary inclusion as long as they have the requisite bike rack on the roof. 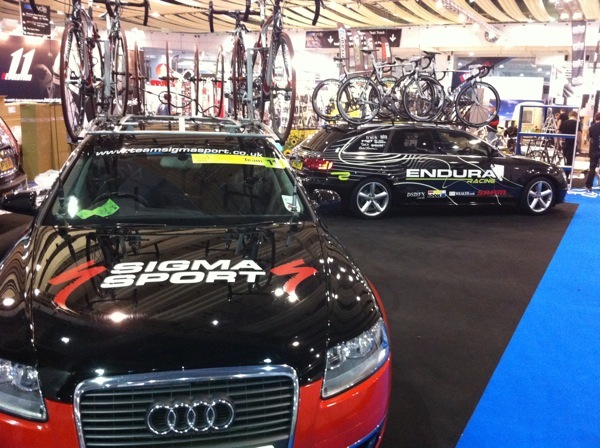 These are the team wagons of the of Endura Racing and Sigma Sport-Specialized pro teams. 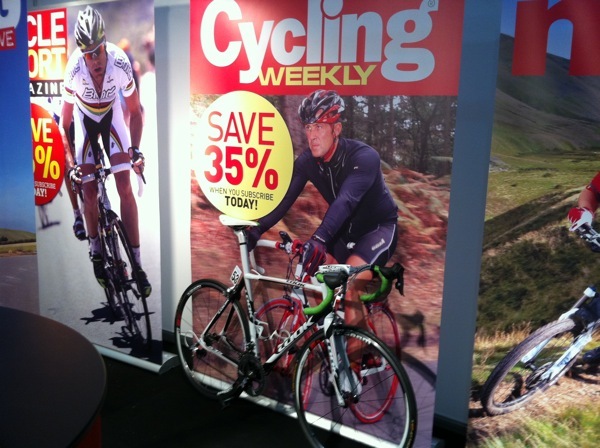 While we’re talking Endura Racing, one of the professional team’s sublime Look 595 race bikes is up for grabs in a competition on the Cycling Weekly stand B12. Don’t miss it.